9-year-old Robia walks into the living room where her mother is seated. She sits down on the couch and pulls out a stack of photos. “I have 4 or 5 really close friends,” she muses, pointing to a few of them in the photo, their arms slung around each other’s shoulders. “In 2010, Robia was 6 months old when she fell ill, with her legs paralysed. No one was able to identify her disease,” recalls her mother Hosiat. After a month in hospital, Robia was diagnosed with poliomyelitis (polio) infection, which can lead to irreversible paralysis. The first 3 years of Robia’s life brought little improvement: she was unable to move her legs, walk or stand on her own, and the hospitals in Dushanbe, the capital of Tajikistan, offered no solution. “We were sent to a rehabilitation centre but nothing much happened there. It was a depressing phase of our life,” says Hosiat. The long commute to the hospital included changing public transport 4 times – a difficult task for a mother and young girl using a wheelchair. However, things improved notably in 2013. The Tajik Ministry of Health and Social Protection, with the support of WHO, set up a disability and rehabilitation programme to develop a national policy as well as systems and services for rehabilitation. In 2014, the programme managed to reach 85% of the people affected by polio in 30 districts. It also reached people with disabilities not related to polio. Over the past 5 years, the success of the programme led to the formation of the National Programme on Rehabilitation of Persons with Disabilities (2017–2020). In the spirit of universal health coverage (UHC), all services are free of charge to people with disabilities. More than 170 000 men, women and children have benefitted from the Programme since 2017. Such programmes contribute to building a health system that is accessible for everyone, including people with disabilities such as Robia. For the young girl, rehabilitation and assistive products mean an improved quality of life and brighter future prospects. For the past 5 years, Robia has been receiving rehabilitation services at the National Rehabilitation Centre for Children in Dushanbe. There she trains in walking, strengthening her spine and legs, and improving her balance. 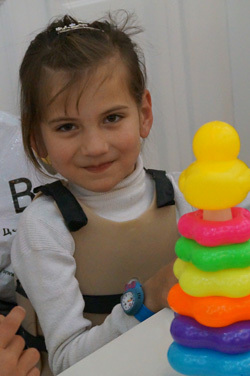 She also received orthoses, braces that serve to support her back and legs. These give her confidence to navigate the gravel and dirt roads on which she walks each day. Today, Robia walks the few blocks to school with her neighbour and is doing well academically, as can be seen in her grade book covered with excellent marks from her teacher. In short, her day-to-day life is full of the kinds of tasks and events that make up a usual day for a young Tajik girl. When asked what she wants to be when she grows up, without hesitation she replies, “A therapist … the kind that helps children.” She does not see any reason why this would not be possible. Robia locks eyes with her mother, and they exchange smiles and nods of agreement. On World Health Day, 7 April 2018, WHO calls on world leaders to take concrete steps towards UHC. This means ensuring that everyone, everywhere, can access quality health services without facing financial hardship, as set out in the Sustainable Development Goals. In the WHO European Region, some countries do well in meeting UHC goals, but all can do better to secure financial protection, especially for poorer people. On World Health Day, WHO/Europe will share stories illustrating the ways that countries across the Region are making progress towards UHC.